Compression therapy is undoubtedly one of the important pieces in the puzzle of venous ulcer treatment. On the other hand, the old saying that an ounce of prevention (or early treatment) is worth a pound of cure could not be more true when it comes to venous ulcers. Preventing the occurrence of ulcers in the first place will positively save the patient a lot of anguish and frustration from a potentially lengthy healing process. There are several things you should pay attention to early on, including the physician or vein specialist you choose to assess your venous issues. Have you noticed any skin changes, specifically in the area below your knees or around the ankle area? Skin changes can be precursors signaling that there could be problems developing down the road if the underlying problem(s) are not addressed in a timely manner. Could your skin changes be due to circulation problems? Approximately 3-11% of the adult population has skin changes and edema due to chronic venous insufficiency (CVI). Circulation issues of veins and/or arteries can be related to health issues like varicose veins, smoking, diabetes or being overweight just to name a few. Venous ulcers are not necessarily a direct result of any of the above stated causes. Frequently they can also develop from a leg or foot injury that won’t heal because of inadequate blood and fluid circulation in the affected limb. Skin changes are the result of blood pooling in the veins of the legs where stagnant blood and fluid then leak into the surrounding tissue and skin causing swelling and sometimes itching, which tends to make things worse. Some people may notice brown stain-like spots on the skin, usually concentrated around and above the ankle area. In medical terms this is known as stasis dermatitis. As the condition progresses, the skin tends to become thin, irritated and if the patient scratches, it may break open and develop into a full blown venous ulcer (or stasis ulcer). Once they appear, these venous ulcers can turn into a chronic condition where the skin sores reopen, even right after they were thought to be cured. How Serious Should You Take Skin Changes and Venous Ulcers? Stasis ulcers or venous ulcers are in fact the most common types of ulcers (approx. 80%) affecting the lower legs. Venous leg ulcers are a major problem among the elderly and tend to be more prevalent with women, although overall they affect only about 1% in the U.S.A.
Leg ulcers can unfortunately take a long time to heal (several years) and have a high recurrence rate often right after they were thought to be healed. If you notice any of the above described alterations on your legs, it may be best to make an appointment with your physician to determine what causes them. Your doctor may have you undergo testing to examine the cardiac, arterial and venous functions to get to the root of the problem. Prior to any treatment of venous issues the arterial circulation may need to be evaluated to prevent additional complications. In addition to resolving the skin breakdown or any existing venous ulcer, the treatment must also aim to pinpoint and address the underlying cause such as venous insufficiency. With regard to exploring treatment options, it should be pointed out that physicians do not always have adequate experience in the care of leg ulcers or in the treatment of vascular conditions. Therefore it may be best to obtain a referral to a wound care specialist or a vascular surgeon who is experienced in circulation related issues as well as in treating venous ulcers. Any leg or foot ulcer should be taken seriously and treated with the utmost attention to avoid further complications. Most leg ulcers occurring as a result of venous stasis can be healed with a timely and proper course of treatment. However, if misdiagnosed, serious complications could lead to amputation of the affected limb as a worst case scenario. CAUTION: Compression Therapy is NOT SUITABLE for patients with arterial ulcers! What Treatment Options are available for Venous Ulcers? Why is applying compression important? Compression reduces edema (swelling caused by pooling blood and/or fluids) and it promotes a process medically known as fibrinolysis. This process, which promotes blood circulation, also prevents the formation of blood clots and its associated dangers such as deep vein thrombosis (DVT) and pulmonary embolism (PE). Compression therapy can significantly increase the healing success rates. Compression therapy is the go to conservative standard treatment for venous insufficiency and for venous ulcers. Depending on the individual situation of a patient there are several other treatment options, including but not limited to frequently elevating the affected leg, medications, dressings and bandages, mechanical treatment devices, oxygen therapy and surgery. The discussion of all these options goes far beyond the scope of this website and this article is intended to focus mainly on the use of compression therapy. Study results have shown that the use of compression therapy facilitates more rapid healing results for ulcers in comparison to when no compression is applied. Compression therapy can be applied in several ways as elastic, non-elastic or intermittent inflatable compression. Elastic Compression materials are elastic bandages or stockings with graduated compression. The main advantage of elastic compression stockings or elastic bandages is that they easily follow the shape and size of the leg or foot. They are also able to adjust to changes such as when swelling increases or decreases. In addition, they are flexible as they can be worn during activity or while the patient is resting. Compression stockings must be removed at night. Patients with good dexterity may prefer to use strong compression stockings for the daily self-care of less complicated ulcers. Some patients also don’t like bandages because they can be rather hot and bulky. The easiest approach for self-care is a two-stocking system whereby one stocking of lesser compression (e.g. 10-20 mmHg) keeps the wound dressing in its position while the second stocking (e.g. 20-30 mmHg) helps to deliver the required compression. This way the second stocking can also easily be removed at night before going to bed. While compression stockings are generally easier to apply than compression bandages, patients with arthritis in their hands or elderly patients may not have adequate strength to don and doff elastic stockings very easily. Donning and doffing devices or stockings with zippers may be helpful in those cases. 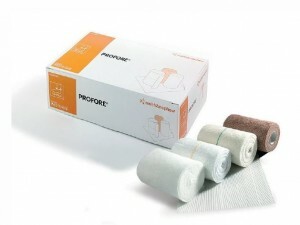 PROFORE* LF Multi-layer Compression Bandaging System provides graduated compression for venous ulcer treatment. Flexible Compression Bandages or compression wraps come in a wide array of options such as single layer, multi-layer, elastic, inelastic, long or short stretching types. Multi-layer compression is considered to be better as compared to single layer bandages. This is because multi-layer bandage systems include protective padding to help prevent pressure damage. The proper application of compression bandages does necessitate a certain amount of skill to gage the proper amount of tension that is needed to effectively achieve the required compression result. *) PROFORE is a trademark of Smith & Nephew, Inc. If applied too tightly, they can create a tourniquet effect or excess compression points. For that reason multi-layer compression bandages are usually applied at the physician’s or specialist’s office after which they remain in place for several days or up to a week before they are changed again. Non-Elastic Compression materials such as inelastic bandages offer minimal or no stretch ability and can therefore not maintain the initially applied pressure after hours of movement or as soon as the swelling goes down. During the initial phase of treatment it may be necessary to change the bandages frequently in order to maintain proper pressure and prevent them from slipping. There are different medical opinions on this topic and some suggest that elastic materials can be more effective than inelastic materials. Intermittent pneumatic (inflatable) compression (IPC) is a boot with inflatable air chambers that is frequently used for patients with limited mobility or individuals who have very little calf muscle. The air chambers of the boot are inflated sequentially and then deflated, which resembles the action of the calf muscle pump. This facilitates increased venous circulation back to the heart resulting in improved oxygenation of the tissue and reducing any existing edema. The overall benefit is a much faster healing process of the venous ulcer. Once a venous ulcer has been healed, continuous use of compression ­therapy can limit the danger of reappearance. This is especially the case for individuals with underlying chronic venous insufficiency who may require compression all their life to prevent the recurrence of ulcers. Unfortunately the use of compression therapy is restricted by the patient’s physical abilities, available assistance and possible contraindications such as heart failure or arterial disease.